Every great achiever knows that at least one person who has come before them has greatly influenced their life at some point. This influence can derive from close study of this mentor’s work, formal instruction, workshop activity, or by reading the proper books. Koch takes great joy in every experience and is constantly receiving visual stimulus and inspiration from everyday life. 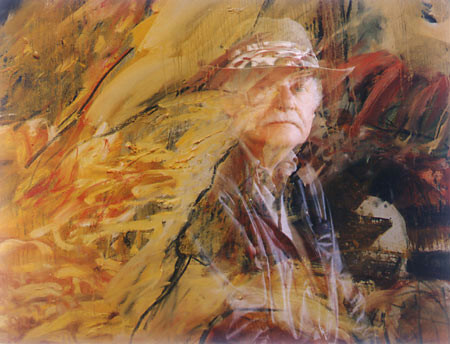 Born in Detroit in 1929, he received a Bachelor of Fine Arts degree in 1951 from Wayne State University and later a Masters of Fine Art at the University of California, Santa Barbara. He has been a member of the National Watercolor Society since 1955 and is listed in Who’s Who in American Art. His work hangs in numerous California museums, including the Los Angeles County Museum, Pasadena Art Museum, Santa Barbara Art Museum, Carnegie Art Museum, as well as in private collections including the Universities of Montana and North Carolina. He travels extensively in order to continually experience the riches of the artistic capitals of the world. By putting together informal world wide tours in which he acts as historian and guide, Koch consistently makes a point of traveling with other people who are willing to watch, listen, and learn; thereby sharing the world with anyone willing to join him. Gerd Koch’s documentation took place in 1997 and 2002. The FOTM Archive contains extensive information about this artist.